Treats with old friends make for great alumni get-togethers, but for the last three years the College of Nursing has sponsored a Homecoming service project in lieu of a more traditional cookies-and-punch gathering. Between the Homecoming parade and the football game, alumni and students gather to assemble newborn kits for mothers in Utah and several countries. While studying abroad, students deliver these kits—which include blankets, clothes, hats, bars of soap, and soft diapers with safety pins—to women in Ecuador, Tonga, and Guatemala. They also donate kits to a local Utah program for young unwed mothers. All supplies are donated. In addition to personal donations, handmade bibs and blankets come from local church programs. 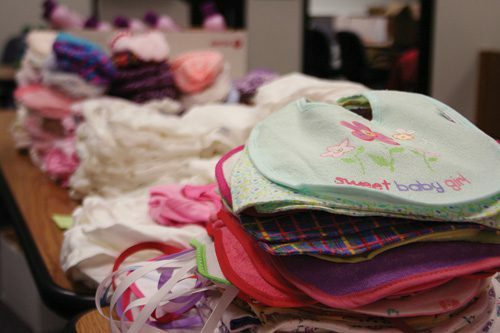 Students in the Y-Serve office in the Wilkinson Center also make newborn hats for the kits. During Homecoming the college completed more than 250 kits in an activity that drew alumni, faculty, students, and community members.